It's fairly common for Google's app updates to be a little less feature-packed in the days leading up to major announcements. Whatever the reason, the changelogs – if there were any – probably wouldn't mention anything more than "bug fixes and performance improvements." The latest release of the Photos app isn't quite untouched, but it's pretty light on changes. The only clear addition is a settings toggle to enable rotation suggestions. Rotation suggestions first appeared in a teardown all the way back in March. The suggestions will appear as cards in the Assistant page. So far, I haven't been able to get one to show up with a few intentional sideways shots, but the Assistant can take a few hours or days before attempting to give advice like this. 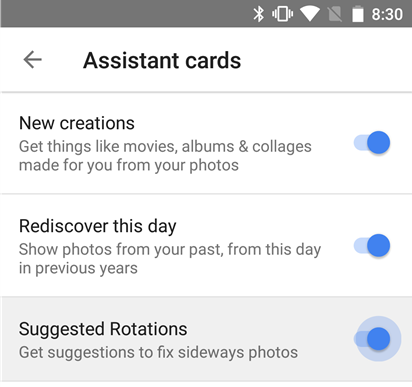 The Photos app will show any pictures Google detects to have been taken in the wrong orientation and they'll have the opportunity to automatically rotate them into the correct perspective. 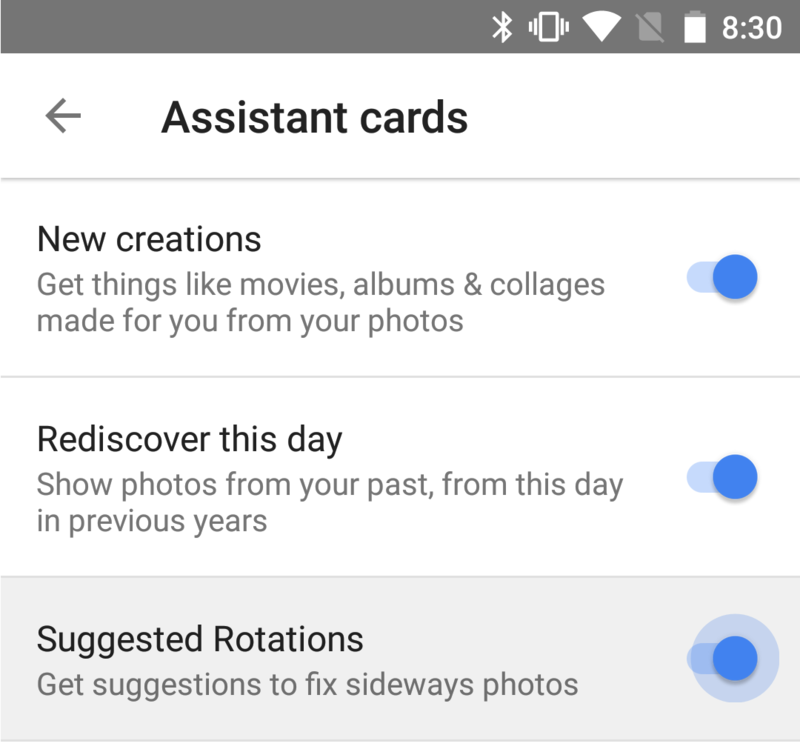 To find the toggle, go to the Settings screen in Photos and open the Assistant cards screen. Suggested Rotations should be the final item on the list (screenshot above). Features like this aren't always available to everybody right away, so just hang tight if it's not there immediately after install. Google also released the official changelog, but it doesn't add anything we haven't already seen. Sharing through contact, email, or phone number was discussed in a recent teardown, then launched alongside "Movie Concepts" with the 2.0 update. Sorting chronologically and manual reordering also came with the 2.0 update. And of course the new shortcuts refer to Launcher Shortcuts, which were discussed in a recent teardown.